I think the next couple days price action will be telling on net-net ADPT on whether or not it can push more. 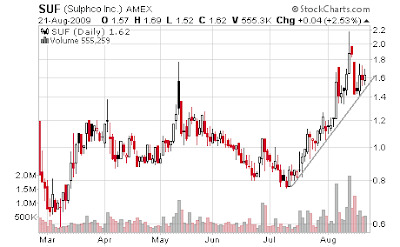 Back in May it double topped right at $3.00 and so far it has already held over that resistance level. Simple market mechanics at work here. Buyers who accumulated in the high 2.90s will be tempted to sell for break even here or new fundamental forces in the eyes of investors will propel the stock higher. People could be selling here and new buyers will come in anyway. 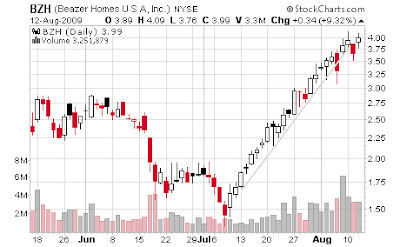 There is just a better chance it will run if a couple possible sellers get shaken off and buyers show they can take the stock to higher levels. 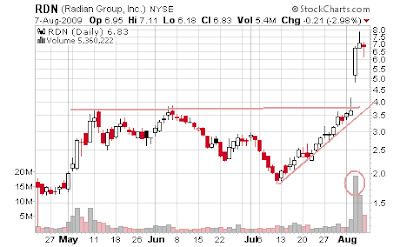 All this is not entirely significant though because the stock has resistance way higher to. With some hesitation because it trades on the OTC this EGMI I will say has very good fundamentals and valuation going for it. They grew sales 76% from 2007 to 2008. They grew earnings 81% in that same period. From reading some of the 10-k their product seems to be a hand-held electronic card that keeps track of winnings at casinos, bingo halls etc. The description was kind of vague to me but I think that is what it is. They have two patents in Europe and Japan and are working on one in the U.S. This card seems similar to me to the type of cards International Game Tech IGT developed to keep track of customers chips electronically in Casinos. 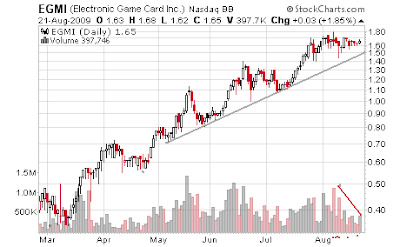 It seems pretty interesting, "The shape of a pocket GameCard is flexible to clients’ needs but is currently approximately the size of a credit card, operated electronically by touch and incorporating a microchip and LCD screen showing numbers or icons." 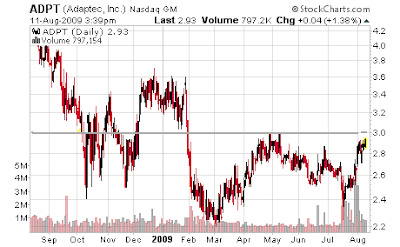 2010 EPS is expected to be $.20 going off of 1 analyst according to Yahoo Finance and Zacks.com. This is growth of 42% year over year. Here is what I like. 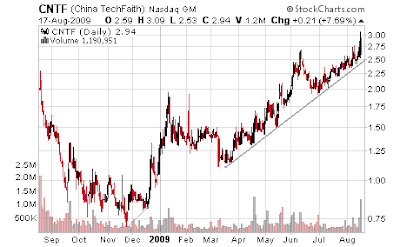 The stock trades for $1.65 so the current years PE is only 12 and the forward is around 8! That is just totally out of whack with their growth rate of 42% for next year. A PEG of around .3. Over the next five years the expected growth rate in earnings is 35% per year. If I'm conservative here and slap on a 30 PE multiple the stock is worth $4 this year and based on next years earnings growth worth $6 a share. This stock is at $1.65 right now. They've got a ton of cash. $9.6 mil in cash quarter end March with just $1.3 mil in total debt with none of that long-term. 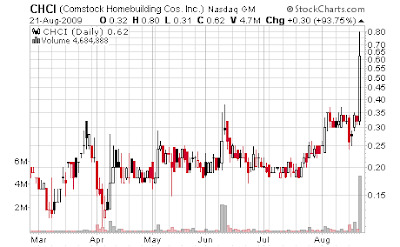 As much as I take faith in SEC filings this is an OTC stock. I am very cautious and skeptical of anything on the OTC or Pink Sheets. My game plan if I even decide to trade this is to just catch a quick trade in it if it breaks out here or maybe buy a move off trend line support or a flag similar to my IFON trade. 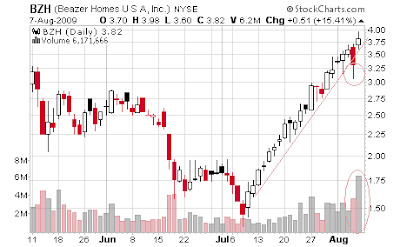 CHCI is a homebuilding stock that can be extremely volatile. If it runs again tomorrow it looks good for a quick trade but if it doesn't just a watch if even. 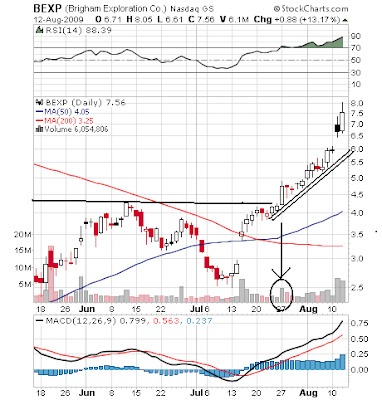 SUF is holding it's trend line nicely. I think this could potentially turn into a bull flag here and the stock could continue higher. Rounding bottom formation. Price action at $1 might be key. 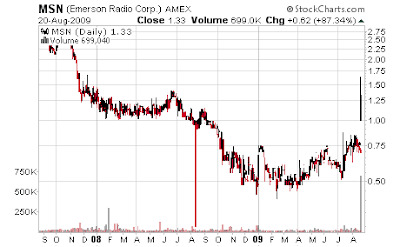 (MSN) Emerson Radio popped 87% on top line growth of 26% year over year. Net income grew 300% year over year. MSN is a perennial net-net. Pretty unexpected results and price action I'd imagine for a lot of people. There was some profit taking as the stock didn't hold the days highs very well. The amazing thing to me is home appliance sales were behind the boost for revenue growth. Home appliance sales? 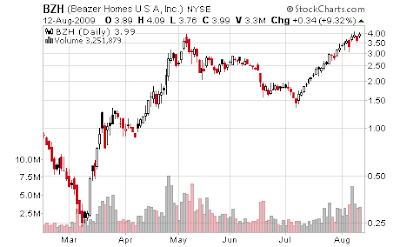 Isn't there a housing recession? Isn't the consumer almost dead? Huh. They put up some pretty decent free cash flow the past couple quarters which is good. They have a good balance sheet with $23.6 mil in cash and quick liquidation value or net current asset value is $44 mil. 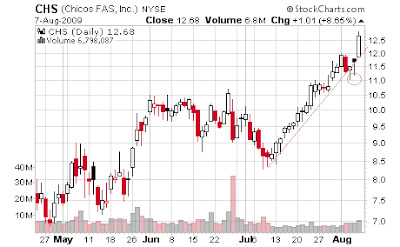 I'd imagine at best the stock trades sideways for weeks or sells off big time here. That's without listening to what management had to say and a scenario where no analysts upgrade. 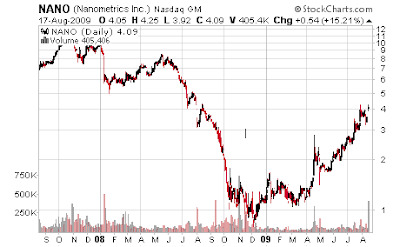 I doubt there are even that many analysts if any though on the stock right now. Maybe something to keep an eye on and possibly, possibly enter on a pullback. Right now I think it is going to have a hard time holding above that gap. FRZ may have another day of run but this won't keep up for long. Short biased. NEPH is in stock pump newsletters. Even shows up on Yahoo finance. laugh. 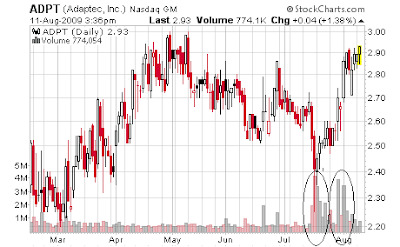 Short biased on major technical breakdown on big sell volume. Though NEPH doesn't have the look of pure manipulation this run could keep up for some days. These are some stocks that had unusual buying volume yesterday during the sell-off. 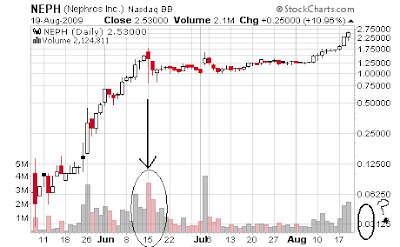 A little break over resistance on a big volume spike for this one. Earnings were yesterday after the bell. 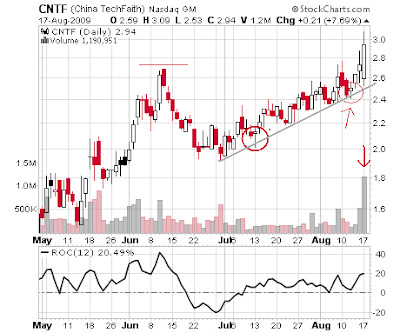 Had a couple hammers off of trend line support. 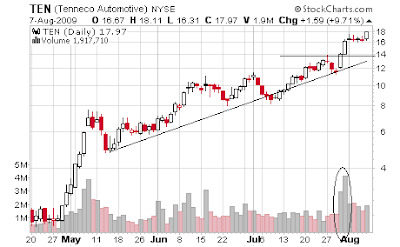 I like buying the day after a hammer on a trend line. I could be a little late with this one but like most of these in this post being patient and waiting for pull-back on trend line support is possible here. Longer time frame. Nice trend line. 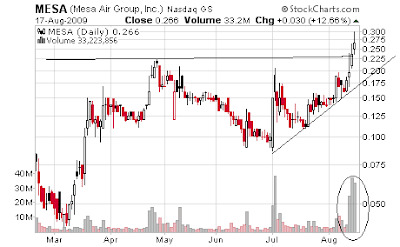 Lots of volume back to back on airline penny stock MESA. PNCL another airline in play. NANO last time volume spiked it sold off for a bit. Just pure momo. Hammer breakout.Hammer breakout. I just stumbled upon this special situation Zareba Systems ZRBA. Looks like they are doing a reverse split and will cash out shareholders who hold fewer than 250 shares for $5.20. The stock closed at $3.60 Friday. full disclosure:No position. May take a position in future. This isn't my watchlist. These are just some charts that I thought were pretty neat and wanted to make an example of. I guess this post is like a diary of charts. 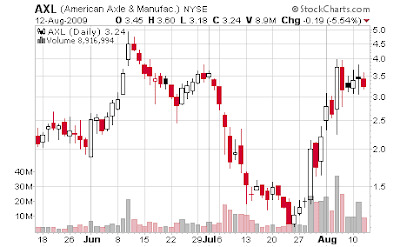 Anyway, AXL traded really well last week. I think this one came in my scans in the low $1's. 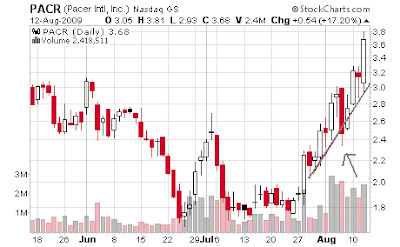 That was when I put it in my watchlist and posted that watchlist on Twitter on July 16th . Before the big run. Yes, stocks like this fell into my lap in my scans the weekend before the market psycho bull run. I bet you remember that week. What a week. Even though they were in my lap that week I would give myself a D+ on trading them. I didn't make enough trades in them. 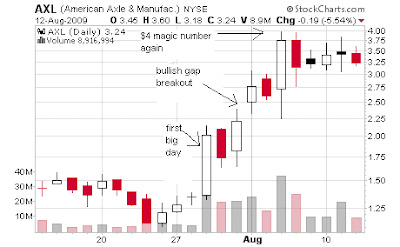 I also only caught about 16% profit on AXL when there was an easy 50%+ to be had as you can see from this chart. AXL ran about 50% if I remember correctly on the first big push day on volume. 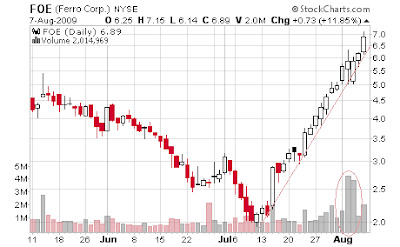 Funny enough that last huge day it had the stock maxed out again at 50%. Pattern? I'd say yeah. But the better pattern is the way it trades. It runs then consolidates the next day. You can see it in the red candles that represent a negative finish for the day. That 50% was pretty cool but the better indicator was when it topped out at $3.98ish for the second day in a row. I think one of those days was actually $3.99 if I remember correctly. 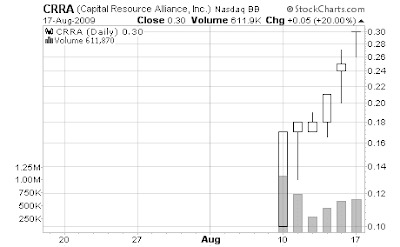 The round number $4.00 was a significant resistance level for the stock. Round numbers and .50 marks on stocks under about $3 are psychological levels and even more importantly important to program trades I feel. Half the volume on the exchanges is computers. I learned the round number edge from another trader almost a year ago. If you were holding the stock long after the shooting star/gravestone candle on the 3 or 5 minute at below $4 you better have been concerned. I was just watching though because I had already taken a profit days earlier and was afraid to chase. Beazer BZH again. Almost an amazing thing to see in a big board stock. Day after day of a rise with few red days. Almost has the look of manipulation. You can see on these you just wait for a pull-back to trend line then you buy when it's on the trend line support. You sell your gain. Repeat. This stuff happens all the time. 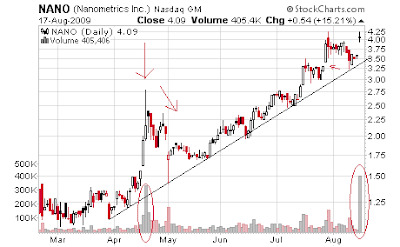 Nice failed signal on PACR when it broke trend line support and still held. Wish I had notice this earlier. Maybe still good on pull-back. ADPT has $370.2 mil in net current asset value and a market cap of around $350 mil. The stock just traded higher today amidst today's market beating. I went back through the blog starting with the first day of 2009 and crunched some numbers on my net current asset stocks pick performance. This assumes one bought them the next day after finding them on the blog this year. If it was on the blog in 2009 and less than net current assets I used it. Looking through the 2009 list there are some that I posted on earlier than 2009 like HHGP which is a -20% loser since the initial post pre 2009,TUES +58% gainer and HKN -35% since its December post when it was less than tangible assets however. I think PARL was on the blog in 2007 or 2008 to but I didn't go back that far and a search didn't turn it up. It would be a looser from then. The rest were fresh for 2009. This might sound a little weird but I think I've said this before. I really had no idea what I was doing with net-nets before around mid-2008. In 2007 when I started following them and most of 2008 I was just feeling them out. From mid 2008 on there are a lot of winners to though of course. These returns below were calculated with the potential buy-in starting the day after it was on the blog in 2009 because I didn't always post during market hours. These returns assume one bought that next day and sold at the stocks high afterward. The likeliness of selling at the high is not highly likely but had one decided to protect the potential profits and sell on the way up it would have been very possible to have come out with a good chunk of the bulk of those profits. About all of these I calculated about 3 weeks ago so some of them are probably up a lot more since then. SMRT hit 10.50 for example. The ones with technicals next to them were ones that technical analysis had a major role in. SKX -46% stock crashed after post. Maybe a little to hard on this one because if doubled down off March lows it went to 14 as of now. I'm going to start tracking the performance of my net current asset stock aka net-net picks better from here out. For it to be a pick I'll do a post on it and say it is a buy at such and such price. I'll also add it to this portfolio here. I'm pretty sure this can be viewed by anyone. I may also add none net-nets from time to time. I'm not liking Tickerspy so far because I haven't figured out how to even sell a position with it. I started a Marketocracy portfolio to which I think I like better but the $1 mil it gives me to manage is a bit much to just show how I can trade these net's. If you've been paying attention to my net-net posts, for months now I have only been putting a net-net up if it is worthy of an actual buy very soon me. Since 2007 I have put up a lot of net-net's as potentials with my thesis on them but didn't always pound the table on them as a buy that day. I'd usually run through the good I saw and the bad. I was good then but I am even better now. From here out my skill with stock picking will be a little more on display be it turn out good or bad. Some time in the future I may switch it over to Covestor.com. Covestor actually taps into your broker so with them there is the most complete transparency possible. For now though I feel like posting on them around the same day I trade them will do. I put up FSII ahead of time because that set-up was so good I wanted put out a heads up. I think the bulk of you that read my blog are here for net-net's and value plays. It's not always easy for me to post up an entry for a net-net trade in real-time on the same day so I might just do these watches. 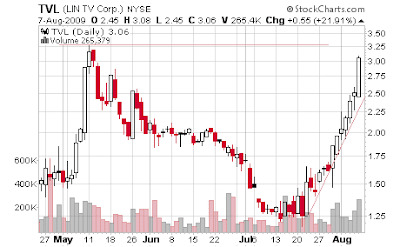 I don't keep as close an eye on net-net's and deep value day to day as I do my other watchlists. I trade a lot of different strategies. I brought up earlier that I want to start charging a yearly or monthly subscription for my net-net picks. If I go that route it will still be months off. You will also have the opportunity to track my progress better before deciding if $5-$8 a month is worth it. As you can see since 2008 it has been going well and I've actually even stepped up my proficiency lately. I've only been following net-net's since 2007 and have made really big progress since just 2008 in them. I have kind of gotten in a groove on which ones to drill down on with the fundamental analysis and focus on. Incorporating technical analysis as a tool in my various strategies has also been very significant. I am a very different investor and trader with net-net's and approach them differently than most investors who work in them. I believe that has really helped me identify some of the best performers better. Counter to anticipated breakdown. Bullish signal.